The ThINKin' Spot: Peach Keen Release Time!! Hello friends and welcome to The ThINKin' Spot! 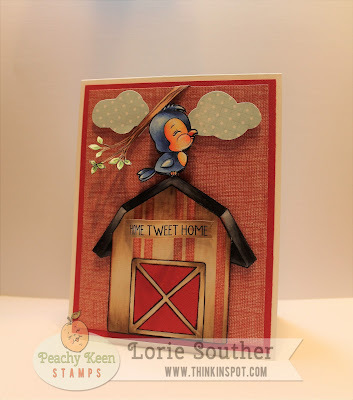 It's release time at Peachy Keen Stamps!! The new June Release is now available for purchase at Peachy Keen Stamps! and home decor projects sweet enough to write home to Ma about. From cows to cats, we’ve got all your cute barnyard critters covered. Did you know that we've brought back our Stamp Club Of The Month? to your door each month! We have 15% off our New Release! Free stamp with the order of "physical" stamps over $20. .99 cent shipping to USA! Here are a couple of cards I made with these new stamps. I sure have a lot of fun creating with them. I'll be honest and admit that it's taken me some time and considerable effort to get back into the swing of things, but I truly had forgotten how relaxing and enjoyable something as simple as coloring an image can be. I lost complete track of time while creating these and looked up at the clock to find I had worked until 1:30 a.m.!! CRAZY, but fun! These cards were all created with the new Stamp of the Month stamp set from Peachy Keen Stamps. So many cute little critters to bring originality and charm to ALL of your cards and creations! All of the images were colored with Copic markers. 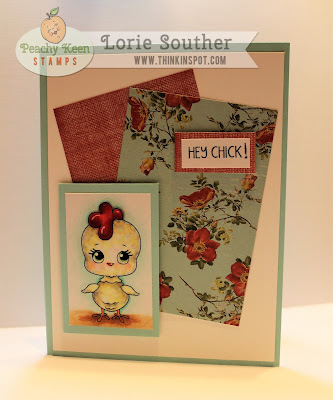 The Cardstock is from Stampin' Up!, and the patterned papers were from my stash. This little piggy is SO stinkin' cute! I can hardly stand it!! The bluebird on this card, I fussy cut three times, and used foam dots in between each layer to give it a three dimensional look. The clouds were hand cut from patterned paper and those along with the branch were attached with foam dots. The photo below shows the dimension of the little bird. Thanks for stopping by! 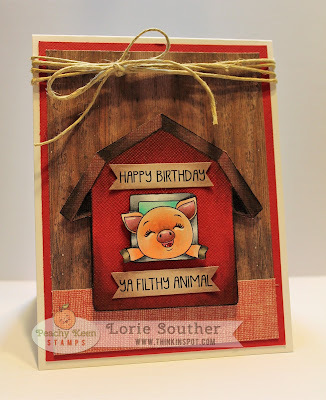 Stop back by tomorrow for another fun project using one of the add on sets from this FABULOUS release at Peachy Keen Stamps! !